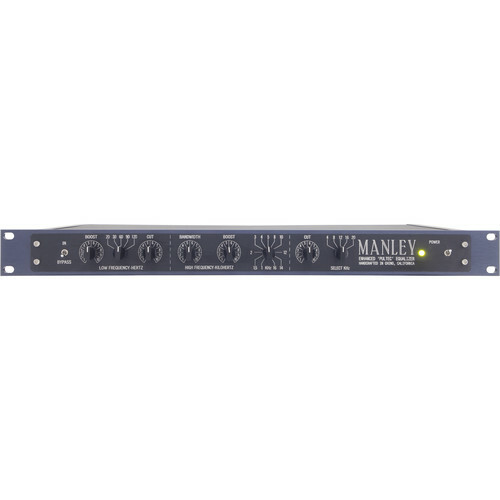 The Enhanced Pultec EQP1-A Equalizer from Manley Labs is a modern version of the single-channel, two-band classic Pulse Technique EQ featuring low and high frequency control, each with simultaneous boost and cut capabilities. Professional-grade components are used throughout and include conductive plastic potentiometers, sealed gold-contact switches, polystyrene capacitors, rolled film capacitors, foil capacitors, custom-wound transformers and a B+ power supply with regulated and balanced heater supply. The all-tube make-up gain block is used to amplify the passive inductor-based circuit providing high output and low distortion. The Enhanced Pultec is divided up into three sections. Low frequency offers a shelf-style filter with frequency selection, boost and cut, while the high frequency boost is a peak filter featuring a variable bandwidth control, frequency selection and boost control. The high frequency cut offers a shelf filter with frequency selection and cut control. Utilizing both cut and boost controls simultaneously results in unique shapes for custom tailoring your sound. Features not found in the original design include an expanded frequency selection, transformerless inputs and outputs, and a gain set preset for adjusting the feedback over the line amplifier. The 3-way toggle switch on the rear of the unit provides phase reversal. The up position retains 0°, while the down position switches the balanced transformer wiring 180° out of phase. The center position switches off the transformer, optimizing the unbalanced 1/4" input to an impedance of 5000Ω. Handmade in the USA, the unit is housed in a 1U steel chassis with a CNC-machined 1/4" faceplate that is also inlaid with laser-engraved inserts. The Enhanced Pultec ships with an IEC power cable.